Flights operate all year round, weather permitting. Start times are 7:45, 9:00, 10:30, 12:00, 1:30, 3:00, 4:30 and 6:00 p.m. The weight limits are 15kg (33 lbs) to 105 kg (230 lbs). Children as young as 10 may fly. If younger children are confident, they may participate. There is no group size limit. If there are more people than pilots on a given day, the participants will wait after the first flight is complete to go with an available pilot. Pickup location is your accommodation and dropoff is the Interlaken city center. No physical fitness is required, but please be mentally prepared for the flight. What to wear? Clothing suitable to the weather the day of your flight, socks, and sunglasses. Due to safety reasons, no mobile phones or cameras with interchangeable lenses are allowed during the flight. Small, compact digital cameras are allowed. All the pilots have many years of experience and possess a passenger flight certificate from the Swiss Hang Gliding Association SHV. 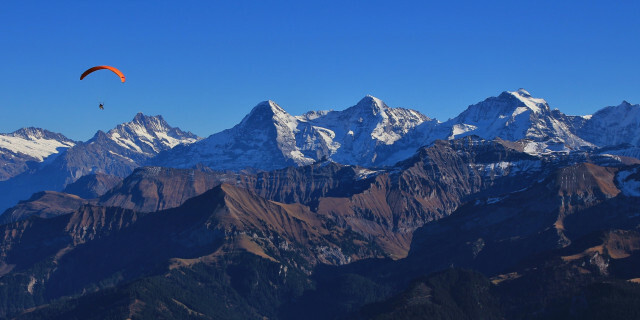 No matter how high you hike, the views of the Swiss Alps from a paragliding flight are incomparable. 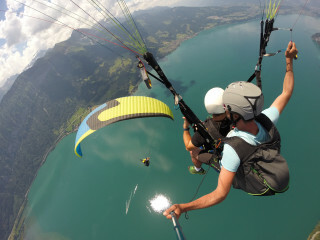 Experience the beauty of Switzerland’s marvelous nature and famous peaks on a tandem paragliding ride with 360° views. Find a new perspective as you reach over 1,000 m (3,280 ft) into the sky. From your hotel or the Interlaken Ost or West train stations, a shuttle transports you to the flight school to get equipped for the adventure. 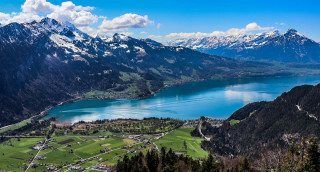 Then, your fully trained and licensed pilot drives you to the launching point in Beatenberg, a locality of Interlaken. Here you assist your pilot in setting up the equipment to learn about the preparation and basics of paragliding. Once everything is in place, you both take a running start down the hill and pull up the canopy (the fabric wing). 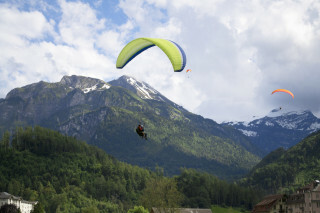 As you catch the wind, you're soon defying gravity over the incredible Swiss landscape. As you fly, you reach an altitude of 1,060 m (3,480 ft). Heights like these offer fantastic views over Interlaken and it's neighboring Lake Thun, a strikingly blue glacier lake. 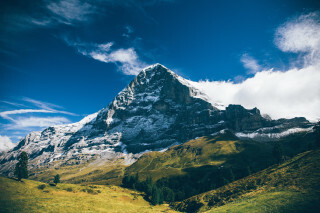 In the distance, you witness the greatness of the Eiger Mountain, a famous sharp peak reaching almost 4,000 m (13,000 ft) into the sky. Climbers come from all over the world to attempt this alpine giant. The entire 5-10 minute flight offers you panoramic views completely unreachable by foot. You and your pilot touch ground just outside Interlaken. The calm sensation and fascination of flying stay with you during the car ride to the city center where you are dropped off. 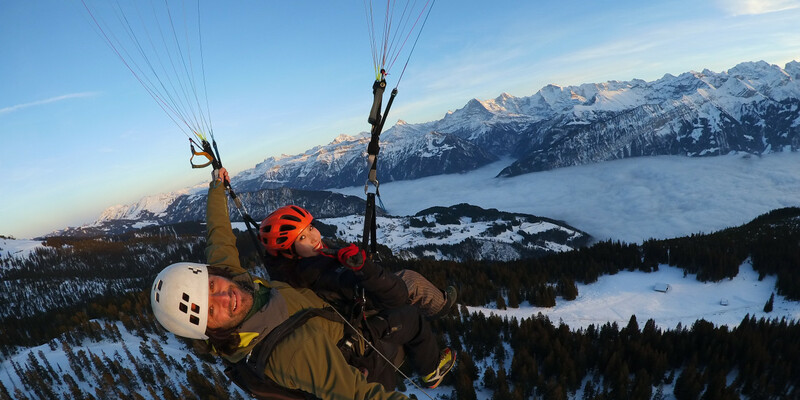 Paragliding among the Swiss Alps leaves you with a new kind of rush in your blood. Whether it’s the stunning perspective of the landscape or the sensation of gliding over one of the world's most impressive mountain ranges is something you need to discover for yourself.